In a constellation in the Southern Hemisphere is a phenomenon that began between 200 and 300 million years ago. It is the collision and merging of two Spiral galaxies that is both destroying them and creating thousands of new stars at the same time. NASA calls this a "state of starburst," whereby all of the gasses within the galaxies are being burned up in the creation of the stars. The largest amount of these gasses is hydrogen and it surrounds the galaxies in long clouds that stream out away from them. These hydrogen clouds are what give the Antennae Galaxy its name: on either side of the collision they form long arms that arch like an insect’s antennae. In the early 2000s, the Chandra X-Ray Observatory discovered many bright points within the Antennae Galaxy. These bright points are super star clusters, neutron stars, or black holes. A super star cluster is like a group of young stars all bound together by gravity. It is thought to be the ancestor of the globular cluster. Neutron stars are the core remains of a star that has collapsed. The black holes that exist in the Antennae Galaxy appear bright to observers since what is actually being observed is hot gasses from the stars within the galaxy being pulled into them. Also discovered by the Chandra X-Ray Observatory is that iron, magnesium, silicon and neon are present in large quantities in the Antennae Galaxy. At least two supernovas have been observed in the colliding galaxies, in 2004 and 2007, respectively.Images from the Hubble Telescope confirm the Chandra observations. The Hubble has photographed the Antennae Galaxy at least three times, in 1997, 2006 and 2013. These images show what appears to be a stormy cosmic dance of stars, gas clouds, dust and light. An arch of stars that have been pulled from other galaxies shows up as a bright blue, red and hot pink corona around the colliding galaxies. 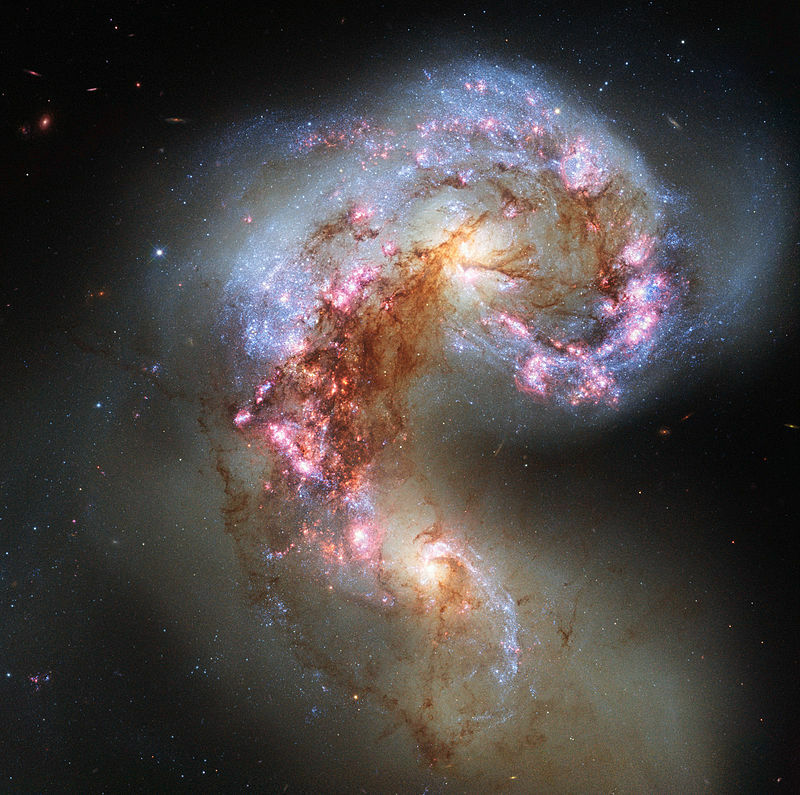 Scientists believe that within the next 400 million years the collision creating the Antennae Galaxy will be complete. At least 10 percent of the youngest stars will die when the galaxies finally collapse into an elliptical galaxy surrounding a super massive black hole. This new galaxy will combine both cores of the original galaxies, predominately old and dying stars. It will be surrounded by hundreds of stars, each with their own planetary systems. It is theorized that when the Milky Way collides with the Andromeda galaxy, a similar phenomenon will take place. British astronomer William Herschel discovered the colliding galaxies in 1785. This was four years after he discovered that the planet Uranus was not a star. William’s sister, Caroline, was his assistant for many of his deep space observations. William built more than 400 telescopes, though he is remembered most for the one that was forty feet (12 m) long, made of iron and perched upon a mount that was fully moveable. It was surrounded by a wooden frame that would not be dismantled until 1839. A 10 foot section of it still resides in the Royal Observatory, Greenwich. William is credited with recording more than 800 pairs of stars that visually appear close together and more than 2000 celestial objects that he referred to as “nebulae.” (It was not until 1926 that many of Herschel’s recorded nebulae turned out to be such things as galaxies beyond the Milky Way. )*Note: May 2008: Research from the Hubble Telescope places the Antennae Galaxy much closer to earth than originally thought, moving it from 63 million light years to 45 million light years.